The Landfill Harmonic Orchestra | Marbella Marbella – Adelante! In our present world with its expanding population, its enormous intellectual potential, its achievements and inventions on almost a daily basis, we appear, according to the international media, to have reached an extraordinary time of creative power with a super abundance of material advantages for a large section of our populations world-wide. High tech internet connections, super mobile phone communications “state of the art” technical achievements , in medicine, science, architecture, aviation, armaments, the exploration of the planets and much more that are propelling the human race in all directions at record speeds. With this in mind, I recommend that our visitors take the time to watch this video and quietly reflect on the simple courage and tenacity of the human spirit in situations that can often overwhelm us, and consider this question. “Why is it, that so many millions of our fellow citizens of this present world exist as the people do filmed in this video ?” when we live in amazingly creative times and have a vast residue of knowledge in numerous fields of human achievements, far surpassing any previous times in recorded history . Cateura in Paraguay, is regarded as one of the poorest slums in Latin America; a small city that has grown on top of a massive garbage dump. It is a village where people live among an ocean of garbage and filth, and the landfill itself has become the main form of subsistence for many residents, who scavenge the waste for items that can be used or sold living in homes that can only be described as shacks; sanitation being almost non existent and any prospects to improve their degraded lives, only achieved in escapist dreamlike fantasy. It’s in this abandoned world of dirt and squalor, that life for most of the children born in Cateura seems abysmal, as they see their prospects as only a future of poverty and degradation, living as close to a hell as can be imagined; awaiting them are the gangs and drug dealers. But miracles do occur, as one day, something amazing happened. A garbage picker named Nicolás Gómez found a piece of trash that resembled a violin and brought it to musician Favio Chávez. Using other objects collected from the dump, the men constructed a functional violin in a place where a real violin is worth more than a house. Using items gleaned completely from the dump, the pair built some other instruments and from this idea an amazing concept came alive. 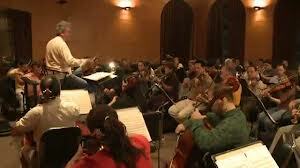 Could a children’s orchestra be born in one of the most depressed areas in the world? Following blind faith, the duo succeeded and now a group of film makers, producers, and photographers are trying to tell the story of the orchestra through a documentary titled Landfill Harmonic, that will offer many of the children opportunities outside of the slum and are already planning a multi-city tour around the U.S.
Marbella Internacional Film Festival Presents - 24 Hours Film Challenge 2011.